If you’re not a developer but you want full access to Clearbit’s APIs, your life just got a lot easier. We’re really excited to announce our integration with Zapier, which brings the full power of Clearbit to more than 500 applications. Even more exciting, you can create multi-step workflows that enrich your leads, trigger emails and tweets, compile robust spreadsheets and collect all kinds of useful data all while you sleep. Zapier helps all of your apps work together. 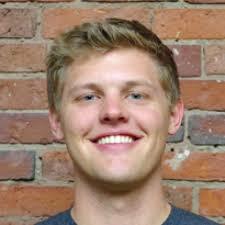 A Zap is an automated workflow that connects two or more apps. When something happens in one app, an action is triggered in another. Zaps can be simple or sophisticated; now they can created with Clearbit. Zapier provides incredibly flexible and powerful infrastructure that makes using Clearbit's data easy and intuitive.Our friends at Help Scout and Expensify have been helping us test it out and we’re excited to open the beta to the public. Here are a few example Clearbit + Zapier use-cases to get you started. 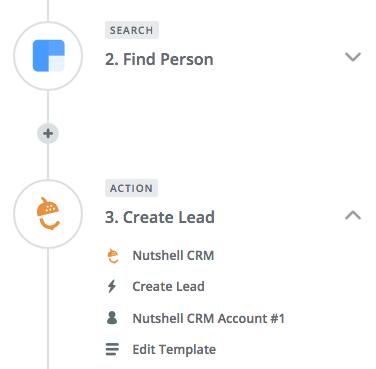 Enrich leads for your CRM. Enriching leads for a CRM is valuable enough that we've already built direct integrations with Salesforce and Close.io. This is a typical Clearbit use-case, but the Zapier integration makes it more accessible than ever. The first thing you need to do is connect your accounts to Zapier. Just browse through their app directory, find your CRM and give Zapier access. Do the same for Clearbit and you're ready to go. 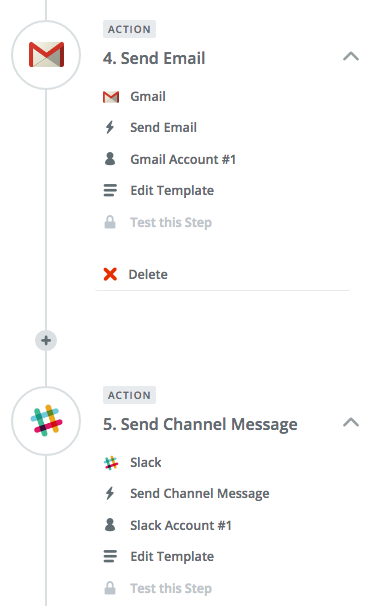 Here’s a hypothetical workflow using the new Zapier + Clearbit integration. 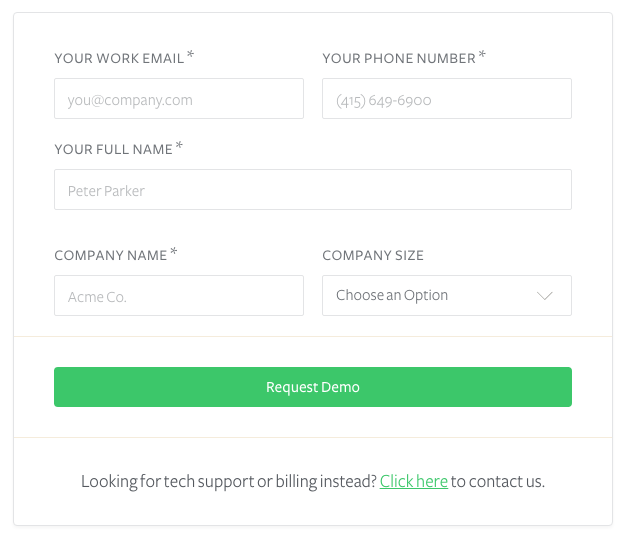 Zapier is triggered when a lead fills out of a form on your site. Once your accounts are connected, Zapier is constantly looking for triggers. When it sees the new contact come through a Wufoo form on your site, it will pass their email address through the Clearbit API to be enriched with 85+ additional data points. Once the data is enriched, Zapier can trigger an unlimited number of actions. It can, for example, pass the lead—along with their role, company name, funds raised, tech used and much more—into your CRM, creating a new entry or updating an existing one. That’s useful on its own, but because you can trigger multiple actions in multiple apps, Zapier allows you to do more with this enriched information. Use conditional filters to score new leads with pinpoint accuracy. 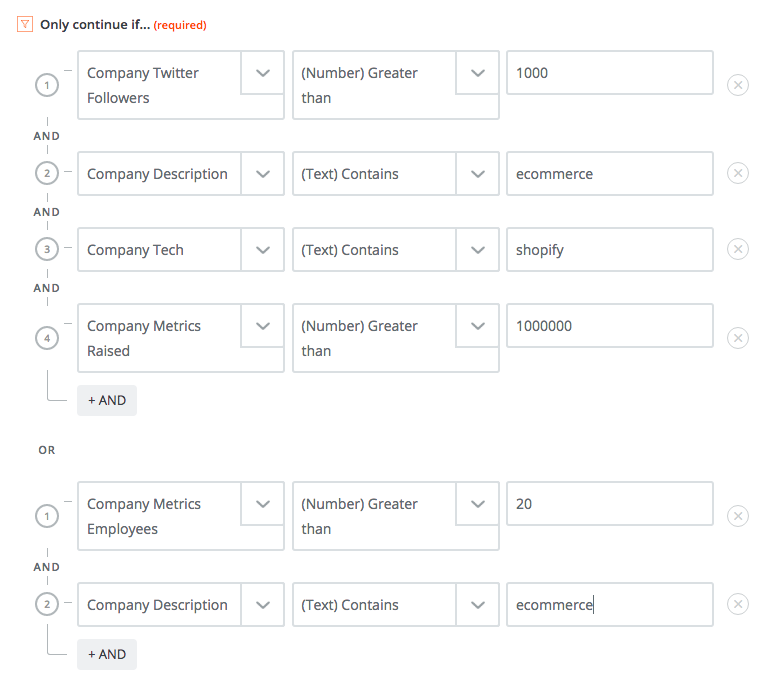 You can use Zapier's conditional formatting to prioritize incoming leads. Here are just a few of the Clearbit data points you can use in those filters to evaluate potential customers and assign them to an account executive. Tech used, including Segment, Salesforce, Stripe, AWS, Intercom and many more. From here, you can trigger as many actions as you want, from automating outreach to updating a database and assigning the right sales rep. Let’s look at a few examples. Trigger targeted outreach and smart notifications. The final stage—Actions—are where the Zapier integration gets really interesting. This when you get to put all that data in the hands of people and apps that can make good use of it. If a lead has more than 2,000 Twitter followers, notify your sales team in Slack. If the lead works for a company with more than 100 employees, trigger a personal welcome email from your CEO. If the lead works for a company with more than $1 million in funding, email all the information to your best account executive. If the lead is located in the Pacific Time Zone, text your top West Coast salesperson. 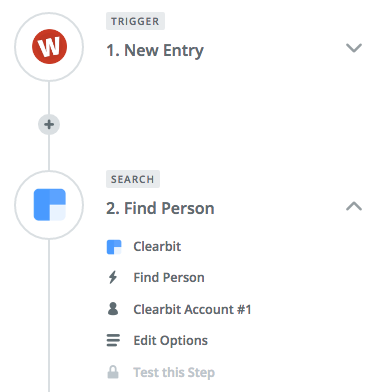 The Zapier + Clearbit integration is going to help you become an automated, data-informed team. Workflows that used to take hours can happen automatically. And workflows that never existed can be put into place in an afternoon. Marketing and sales automation just took a huge step forward. Here are a few of our favorite (pre-built) use cases to get you started. For complete documentation and plenty of example Zaps, check out our [integration page](https://zapier.com/zapbook/clearbit/).